I’ve had an affinity with Dragons since I was young. I always found them fascinating, in films and cartoons, on beautiful Chinese artwork and elsewhere. Over the years, I’ve often been drawn to dragons of many different types. Gifts given to me over the years have involved oil burners, soft toys, calendars and figurines. Similar to my affection for old Egypt, Dragons have just always found a way to reach me. I fell in love with some artists that do fantasy art of elves (another love of mine) and Dragons, like Anne Stokes. I have been surrounded by Dragons my entire life! In mid-2013 I connected in with a Dragon and called it in to work with me. It became (or I became aware of) a part of my Aura, circling around my body like a gentle, graceful vortex. It was similar in some ways to the energy I felt when doing Qi Gong exercises, where you are moving balls of energy around your aura. In early 2015 I was lead to a special location in Bristol (UK) and communicated with a Dragon that was residing as a protector in the gardens. Dragons are often used to protect energy portals across the world. Later in 2015, in a meditation, I was lead to visit the Dragon Stone- in a secret Garden. In the Garden I connected to the Dragon Stone, a mysterious stone with interesting markings, and when I held it- it glowed. Upon glowing it brought new energies through and I was aware of Dragons flying around me and wanting to let me know they were there. 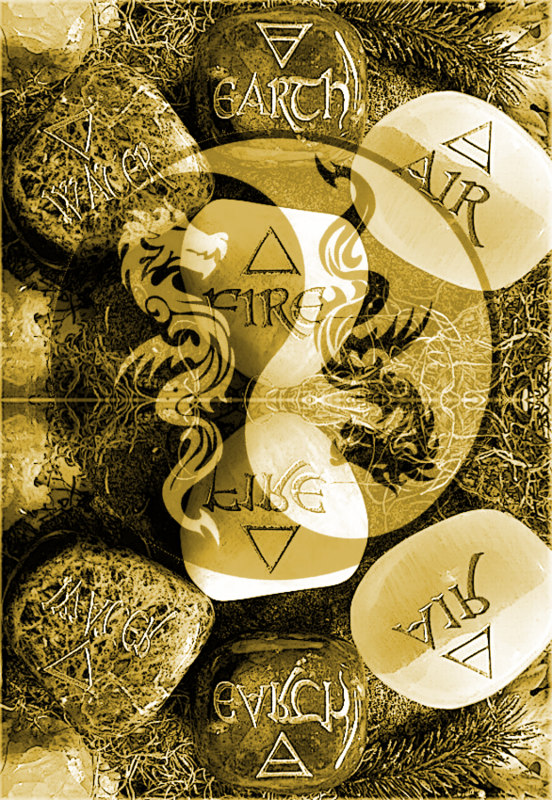 I was given two symbols to work with, to call in the elemental magic of the Dragons and the Keepers of the Dragon Stone. This is connected to the Dragon Star, from which this therapy gets its name. The Dragons gave me a clear message, to integrate them into a healing sessions, where I ‘hold the space’ for the Dragons to come in and do their work. I assist where necessary, but it is when the Dragons ask me to. The four types of elemental dragon and your association will often have nothing do do with the association elementally with your star sign. They are connected to the Dragons lines within the body and on and around the planet. Incidentally, I am an Air sign and am aware of three dragons working with me, one Fire Dragon, one Earth Dragon and One Water Dragon. I guess that’s balance, huh? EARTH– Earth Dragons rule and represent the North, they stand for responsibility and prosperity. They are the the guardians and protectors of trees, forests and mountains. AIR– Air Dragons rule the East. They stand for intelligence, optimism and joy. Air Dragons work with wind, storms and the weather in general. FIRE– Fire Dragons rule the South. Fire dragons invoke passion, courage, power and leadership, amongst other things. They protect and work with volcanoes and lightning, blood and chaos. They can be the hardest to work with, because of the chaos factor, but also the most rewarding. WATER– Water Dragons rule the West. Sometimes without wings or legs, more serpent like in physique. Water Dragons work with the energies/ traits of seas, lakes, lochs and mists. n.b. All elemental dragons have cross-over traits- for example, Air Dragons also work with mountains, forests and volcanoes. Dragons operate on many different levels, they are best met with an open heart though. This is because they have been persecuted by many foolish civilisations over time. Many have depicted the serpent beings as either ungodly, beastly or out and out dangerous. This is based on Dragon stories of beings banished, chased, cursed and demonised by those that chose not to understand the world that was going on around them. Sadly, the stigma gets passed on to this day with stories of great Dragon slayers. The healing properties of Dragons, in general is very pure. Dragons have big hearts and are very loyal. They never leave you, it is always you that would leave them. Dragons never forget you. If you have connected to one in the past, there is always time to reconnect with them. That said, you may wish to be grateful and humble with Dragons. Never take them for granted. It is truly a gift and an honour to work with them and allow in the elemental magic which they work with. Dragons work with both divine feminine and divine masculine energies, act as carriers of divine information and wisdom. They carry pure heart-felt protection. They are very powerful allies. Dragon Star sessions are normally 30-45 minutes long. They begin with the recipient sitting in a chair or on a treatment couch (similar to Reiki, etc.) and I then use a combination of shamanic-style breathing, drawing the symbols and mentally opening the space- invite the Dragons in to begin the healing and/or send messages. This isn’t a standard healing session and it feels it would be wrong to artificially strectch it out into the normal perceived ‘hour’ that we need for healing to take place. On the other sied you are also free to relax in the chair/on couch after the treatment. There is no rush to get up afterwards! You may wish to bring a journal or notepad to write up any messages that you received, as you may be in a meditative state during the process and be receiving messages (due to being in a calm very receptive state). I may have some messages to give you, it feels like the Dragons like to contact the recipient directly, but may use me as an intermediary where it has not been possible to get the message across.